How cousins Luke and Jordan decided one day they were going to go in search of a dinosaur in the Congo. ‘Hitched’ is their story. As TV show pitches go, ‘Hitched’ is really kind of out there. And yet that’s just what cousins Luke MacDonald and Jordan Deall threw in the direction of the Discovery Channel. 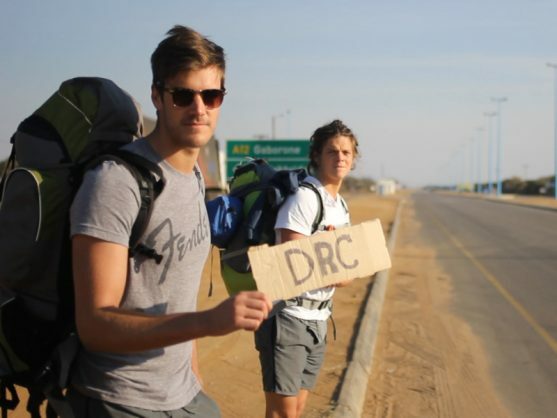 The result is ‘Hitched: Congo’, a ten-part documentary that follows the two lads over a period of 107 days in which they covered around 15,000 kilometres through ten countries. While they did spring for the odd bus ride, most of the distance was covered thanks to the generosity of complete strangers who offered them a lift. Here’s a bit of a spoiler alert; Jordan and Luke probably didn’t really think they’d find Mokele-Mbembe. It won’t come as a shock that the pair weren’t in the news recently for uncovering a Jurassic specimen in the DRC’s jungle. Rather, the more time one spends in their company, the more one realizes that Mokele-Mbembe was just a convenient excuse for them to sling on a couple of backpacks and hit the road. Luke and Jordan were bitten by the travel bug after they’d finished their courses at uni around five years ago. According to Jordan, they were sitting with some friends having drinks and someone came up with the idea of seeing how far they could hitchhike into Africa on the smallest amount of money. It turned out that R5,000 was enough to get the pair of them from Durban all the way to Cairo. To a casual onlooker the pair’s travails sound bonkers. Heading into the great unknown with a small amount of money and some camping gear is a prospect likely to cause nightmares for even the most liberal of parents. It’s also worth noting that Luke and Jordan ran into their fair share of trials – some of which were more serious than battling with the language barrier, dehydration in the African sun, and the prospect of sitting on a stretch of road for four hours at a time waiting for a potential lift. Of course, there’s also the fact that the end destination for the two was the DRC, a country that has been wracked by war for decades. What makes ‘Hitched: Congo’ so worth the watch is the infectious nature of these hardy travellers. Their journey had its fair share of hardship, but it’s also filled with instances of lighthearted warmth. Jordan and Luke are easy-going guys and the only bone of contention between them is that Luke fancies himself a skilled fisherman and Jordan thinks this is rubbish. Yes, the two get into some scrapes – at one point they were thrown in jail for a week in the DRC – but these are intercut with episodes such as Jordan having to take his trousers down in order to convince some bar patrons he was neither Luke’s mother, nor the camera man’s wife. ‘Hitched: Congo’ is now in the can – viewers can catch it on Discovery Channel on DStv – but Luke and Jordan are apparently getting itchy feet again. Based on whether their program is a hit, it’s probably not going to be very long before they head off into Africa again. This time, though, Luke vows they’ll be more prepared. ‘Hitched: Congo’ is broadcast on Discovery Channel (DStv 121) on Tuesday nights at 8pm.